After the trip to Waimea Valley, we took the western route back to Honolulu, stopping in Wahiawa for burgers at Teddy’s. Normally a place that is advertised as “Teddy’s Bigger Burgers” wouldn’t immediately make my short list: of the many adjectives I look for in a good burger, “bigger” isn’t at the top of the list. But I didn’t let the name stop me: I had heard rather good things about getting a teriyaki burger in Hawaii (it’s one of those standard things you can expect at most places selling burgers in Hawaii), with a liberal application of teriyaki sauce… and that Teddy’s was one of the better places to get one. So we stopped in to give it a try. Stepping inside Teddy’s, the first thing that came to my mind was “California burger joint”, since it’s veyr clean and neat, with a lot of bright colors, like, say, Urbun. 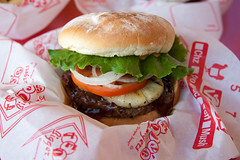 And like a lot of burger joints these days, they’ve got a lot of great burger options on the menu, with such specials as the Kailua (mushrooms, swiss, teriyaki, and grilled onions), the Hawaiian (the Teri burger with a slice of grilled pineapple), and the Bandito (grilled jalapenos and cheddar sauce). But since I wanted to try a Teri burger, I opted for the Hawaiian, and a side of garlic butter fries. Well, the burger was a nice surprise. A lot of places that have a huge toppings list seem to focus on that instead of the burger, but underneath the substantial slice of pineapple and the heavy applications of teriyaki sauce, was a surprisingly good burger: with nice, rich and juicy beef, nicely cooked up medium rare with a nice crisp on it. The foundation was good. The next surprise was the teriyaki sauce. Usually teriyaki sauces are a combination of strong flavors of salt, sweet, acid, and umami, but the fairly thick sauce they use was actually fairly subtle, complementing the meat instead of completely burying it. Add in a nice slice of grilled pineapple, and this was actually quite a great burger. I’ll be craving another for a while. The fries were pleasant as well, although they weren’t kidding about the “garlic and butter” part: the garlic was liberally applied, and the butter very liberally applied, so the bottom layer was basically swimming in them. 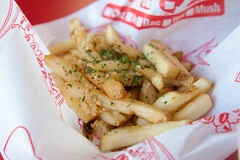 But, like the burger, the fries themselves were very nicely done under all the fuss, so these were pleasant as well. Overall, I really liked Teddy’s, and I’d have to say, if I had one around I’d probably put them ahead of places like Five Guy’s. 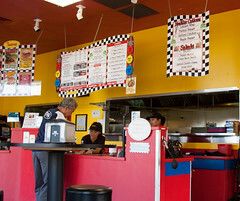 Very good burgers, and some great toppings, especially the nicely done Teri burgers. My brother, being an expat, often found himself craving a proper hamburger. Which is difficult, since Britain is notoriously bad for their burgers (doubly-so since the Mad Cow period, since most burgers here are cooked to oblivion). But in the interest of keeping my brother from going crazy, I asked around, and several reliable sources of mine (primarily from SeriousEats) recommending Byron Proper Hamburgers.